Git submodule tutorial – Cocoapods might not be the solution. Recently I’ve been in lots of discussions about git submodule Vs cocoapods, and I noticed that, unfortunately, lots of developers never tried submodules, like the normal flow nowadays is to just go directly to cocoapods. Lots of arguments on why cocoapods is better are actually something that git submodules also does very well, like “semantic versioning”. Truth be told, I don’t think cocoapods is all bad, but I do think it tries to solve problems that doesn’t exist and add new issues in the process. – If you want a different config from the one cocoapods generates, you’re going to have a bad time. In my opinion the disadvantages of it succeeds the advantages by a large amount. I never thought “Man, adding a new lib/framework to my iOS project sure is tedious and time-consuming, I wish there was a way to improve it” simply because I think it’s very fast to do it manually and it doesn’t compromise the control you have over *your* project. This is my justification on writing this post, I just want to show how simple and easy is to use git submodule, a well supported, simple, non intrusive and robust way to add third party libs to your project, without adding any new dependency (Assuming you’re using git). It’s pretty simple actually, just imagine that the git submodule is nothing more than another git repo inside your own repo. This is particularly good when you work on both projects (main and submodule) because the workflow is basically the same, when you want to work on the submodule project, the way you add,commit,push files is everything you already know and love. 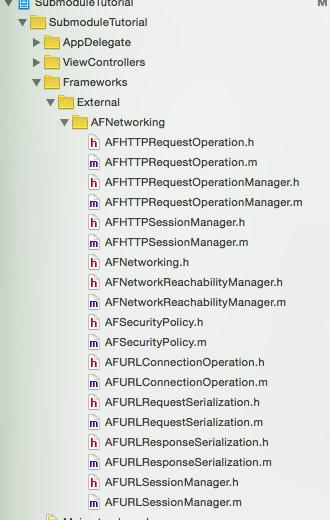 On this tutorial I’ll create a simple Xcode project and add AFNetworking to it. I’ll assume that you already have a git repository up and running with your Xcode project, so I’ll skip these steps and go right to the submodule part. This is the config of your submodule, simple, easy to understand what’s going on, no mystery. Now, the final step is to just add the files you want from AFNetworking to your project, how you want it, whatever way you think is best, no auto config, no hidden settings. (https://github.com/Bunn/Git-Submodule-Tutorial/tree/master/SubmoduleTutorial/Frameworks/External) that goes directly to the host page. Pretty cool, right? Of course, this is just scraping the surface of what can be done with submodules, but I just wanted to show how simple is to add a submodule to your project. And later, if you want to clone your repo (or any repo that has a submodule) there’s just one extra step. This is your “pod install”, but it’s incredible fast compared to the cocoapods alternative (The recursive flag is optional, as you might think, it’s just to get submodules of submodules if that’s the case, but it’s a rare scenario). As I said before, cocoapods is not all bad, but I really think developers should give it a try to git submodule because I’m pretty sure it will solve 90% of problems without adding yet another project dependency. Also, it’s way smarter to decide if it’s better to use cocoapods or submodules once you have at least the bare minimum experience with both approaches so you can weight the options and make the best decision. I’m not a cocoapods hater, as all technologies, cocoapods is just a tool that you need to consider to solve your problems, but I do believe lots of developers think that it’s the only option out there where it’s not true, there’s already a pretty solid solution ready to go with their git repo. Also, while we are on the subject, I strongly recommend this read, an awesome post about having to think a bit before adding third-party libs to your apps.